Fires at a controversial state project in Milford remain under investigation. Early last week, fire destroyed three buildings under construction at the beach. Investigations into the cause of those fires are ongoing. On Sunday, more fires broke out, this time in metal storage containers at the beach. In a statement, officials from the Department of Energy and Environmental Protection said those container fires were intentionally set. “EnCon Police have increased patrols at the park. At this time there is no information concerning a connection between this morning’s incident and last Tuesday’s fire at the park that destroyed three buildings under construction,” said DEEP’s Lee Sawyer, in an e-mailed statement Sunday. The containers that caught fire Sunday were part of the construction for the project to build a bathhouse, concessions stand, and office space. They were scheduled to open Memorial Day weekend. 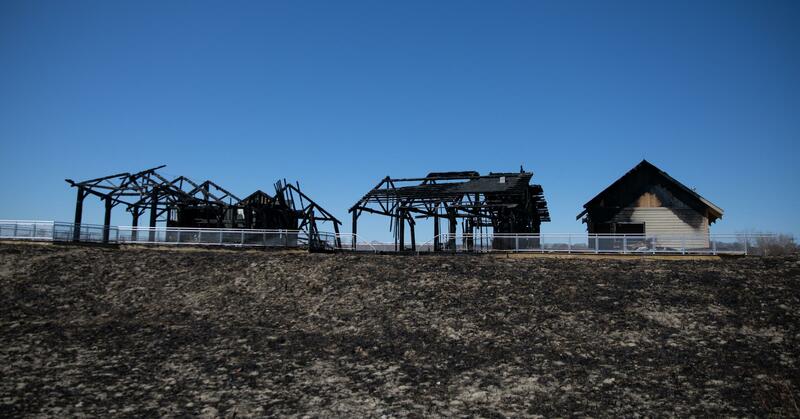 At Silver Sands, three main buildings were impacted by the recent fires. Rose said she’s surveyed the damage and any decisions to rebuild could take time. “The main damage was the buildings. It was just horrible, the middle building was completely burnt down. All that was standing were charred remnants of some of the framing,” Rose said. She said even some of the sand dunes burnt. “It was a very hot fire,” Rose said. DEEP officials say anyone with information is asked to call the Connecticut Arson Hotline at 1-800-84-ARSON. There is a $2,500 reward.